Whether you call it Prime Rib, Standing Rib Roast, or a bone-in Ribeye Roast this is one recipe that is full of flavorful nuances. 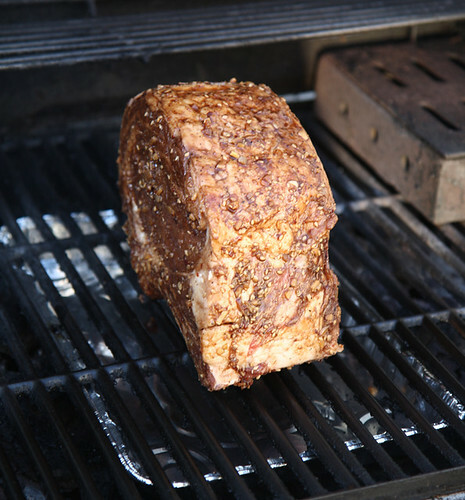 Take well-trimmed roast and place into large zip lock plastic bag, pour marinade evenly over meat, and refrigerate overnight. 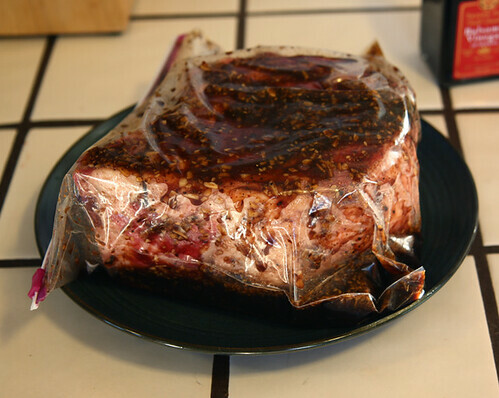 Be sure to turn the bag over at least once halfway though the process to ensure even marinating (I also like getting some marinate time on the sides of the roast, as well). HINT: Place marinating bag on a plate, just in case it springs a leak. Unless you like cleaning marinade out of the nooks and crannies of your fridge … yes, this was learned the hard way! Once fully marinated, it’s time to get cooking. This can be done in the oven (325°) with a roasting pan and rack. But, a real Caveman likes to do this on the grill! Place cake pan centered under BBQ grill, then light. (NOTE: If using charcoal, first light coals and allow to grey-out. Then spread coals evenly around perimeter of grill, leaving a hole in the middle of grill, and place cake pan in hole.) This is important in order to avoid flame-ups! If using gas grill, turn off middle burner. 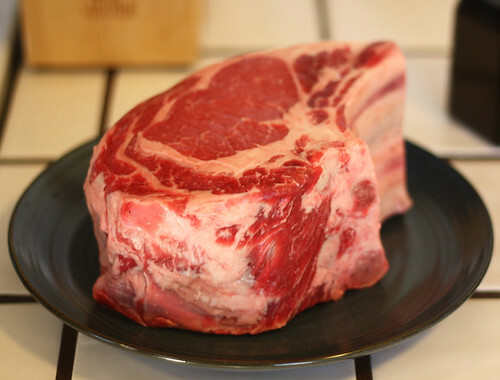 Place roast on grill, BONE DOWN, centered over cake pan. Save remaining marinade for liberal basting every 20 minutes during the first hour of cooking. Cover grill and try to keep hood temperature around 300°. Should be done in about 90 minutes for a 4 pound roast (longer if cooking bigger roast). When done, place roast on serving plate and let stand for 10 minutes before slicing. 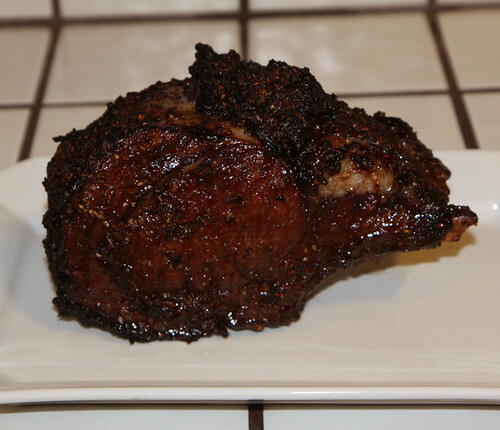 The meat should be tender, juicy and full of incredible flavor. 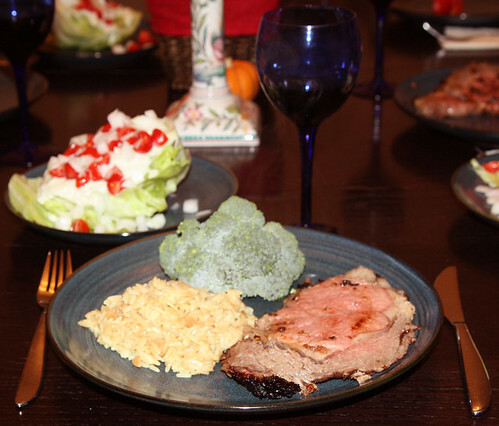 This time, we served it with Rice Pilaf, fresh steamed Broccoli, and an Iceberg Wedge Salad. This entry was posted on November 5, 2009 at 4:25 AM	and is filed under BBQ, Main Course. Tagged: BBQ, beef, cooking, food, glaze, grill, grilling, marinade, world spice merchants. You can follow any responses to this entry through the RSS 2.0 feed. You can leave a response, or trackback from your own site.